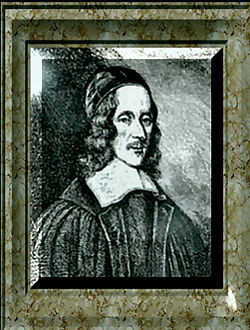 George Herbert (April 3, 1593 – March 1, 1633) was an English poet, orator and a priest in the Church of England. The poems of his final years, written while a clergyman at Bemerton near Salisbury, have been said to resemble nothing else in literature. They combine a profound spirituality with a restless experimentation and their language remains fresh and inspiring, even today. Herbert balanced a secular career with a life of theological contemplation, and the delicate balance (and occasional struggle) of such a life is reflected in the poetry he produced during a short life in which he held positions successively at Cambridge University, in the British Parliament, and his last three years in service of the Anglican Church. His mastery of just the right details in just the right order has made him, after centuries of neglect, one of the most beloved poets of the seventeenth century. Herbert was born in 1593, the son of Sir Richard and Magdalen Herbert. Herbert's family was wealthy, eminent, intellectual and members of the noble class. Herbert's family was deeply involved in the currents of English literature and poetry, and often had prominent poets as guests at their estate. Herbert's mother, in particular, was a patron and friend of John Donne and the metaphysical poets. His older brother Edward, later Lord Herbert of Cherbury, was an important poet and philosopher, often referred to as "the father of English deism." Wear Venus' livery? only serve her turn? Outstrip their Cupid easily in flight? Will not a verse run smooth that bears thy name! Than that, which one day, worms may chance refuse. Poets to turn it to another use. Why should I women's eyes for crystal take? To praise, and on thee, Lord, some ink bestow. While matriculated at Trinity College, Cambridge, Herbert took the post of public orator of Cambridge, a position to which he was probably appointed because of his poetic skill. During his time at Cambridge, Herbert published his first poems, a pair of elegies written in Latin, mourning the death of Prince Henry. Herbert called his position as public orator ‘the best place in the university.’ The two previous orators had risen to high position of influence in English society, and Herbert initially hoped to do the same. In 1624 Herbert became a Member of Parliament, and a political career seemed to be just beginning. Herbert himself indicated in private correspondence that he hoped to attain an appointment to the court of James I. However, in 1625 James died, and two other patrons who had shown Herbert political favor died shortly thereafter. Turning away from a life in politics, Herbert turned towards the Church, and was ordained as a priest. In 1630 Herbert became a rector in the small village of Bemerton. During this time he became close friends with Nicholas Ferrar, a former resident of the village who had founded a religious community a few miles away in the town of Little Gidding (a name, now connected with one of the sections of T.S. Eliot's epic poem Four Quartets, in which Eliot was directly alluding to Ferrar's community and the metaphysical poets.) During this time Herbert devoted himself to his parish and to the work of repairing and expanding the village church. He wrote poems continuously through this time, including all of the great poems for which he would be remembered, but never attempted to publish any of them. Suffering from failing health only three years after having taken up the priesthood, Herbert, on his deathbed, gave a collection of his poems to Farrar, asking that they be published if they might "turn to the advantage of any dejected poor soul"; and otherwise, to burn them. Herbert described the poems as "a picture of the many spiritual conflicts that have passed between God and my soul, before I could subject mine to the will of Jesus, my Master, in whose service I have now found perfect freedom." Farrar had them published immediately under the title The Temple: Sacred Poems And Private Ejaculations, better known today as simply The Temple. By 1680, Herbert's poems were so popular they had gone through over thirteen printings. While thou didst wink and would not see. Here, in this poem, Herbert demonstrates perhaps his most prominent quality as a poet: his parsimonious use of language—the selection, that is, of just the right words, and nothing more. Unlike most other poets writing in the seventeenth century, Herbert attempted throughout his poetic career to write less and less instead of more and more. The precision of his language in his finest poems is unmatched among his peers. Consider the "silent ear," the "heartless breast," and the echoing of the final couplet's chimes in the ending rhymes. Herbert's mastery of just the right details in just the right order has made him, after centuries of neglect, one of the most beloved poets of the seventeenth century, and his influence has extended to, among others Gerard Manley Hopkins, Elizabeth Bishop, and James Merill. This page was last modified on 14 June 2017, at 21:22.